The election of a new leader will do little to solve NPAD’s woes. The New Politics Alliance for Democracy (NPAD) started the week under new leadership. 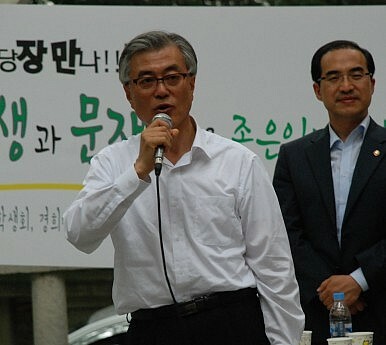 Moon Jae-in, 2012 presidential candidate and former chief of staff to late President Roh Moo-hyun, was elected to the position of party chairperson, defeating rival Park Ji-won by a narrow margin. While Moon has pledged a “new start” to the beleaguered opposition party, the obstacles might prove too great. Let us review two of them. Obstacle one: factional strife. Moon represents the highly divisive pro-Roh Moo-hyun faction. It is difficult to comprehend, much less analyze, intra-party politics (the proverbial “black box” in the political science literature), but one can learn quite a lot about the inner-workings of the party by observing the collaboration and clashes among rival factions. Factions divide all political parties in any democratic polity, but NPAD and the South Korean Left seem particularly fragmented. Long-time followers of South Korean domestic politics will recall that it was acute factional strife that caused a breakdown in party discipline and a split of Roh Moo-hyun’s Millennium Democratic Party (MDP) (pro-Roh supporters formed a new liberal party: Uri Party). Since then, members of the so-called “Roh faction” have often been at the center of intra-party strife. NPAD doesn’t seem disposed to an MDP-like split, but current intra-party rifts make it likely that Moon will face as much opposition from within the party as he will from the ruling Saenuri Party. Obstacle two: low public support for NPAD. There are plenty of reasons much of the South Korean public shows little support for the country’s main opposition-liberal party: weak party solidarity, no clear party platform, and policy positions not significantly different from the conservative part, to name but a few. While no one reason can alone explain it, it is clear that NPAD suffers from a dearth of public support. Gallup Korea’s latest opinion poll (February 6) tell us this much. It shows that over the last 20 weeks no more than 24 percent of the total (sample) population has supported the mainstream opposition; no less than 41 percent has supported the ruling Saenuri party. Tellingly, the percentage of those who support no party has always been higher than those who support NPAD. What’s more, among the 19-29 age cohort – those who, in theory, should support the Left – only two percent more (27 percent) support NPAD over Saenuri. This is not surprising. As I’ve argued before, it seems that the Left has lost the youth vote. With the rise of Moon Jae-in, a politician who embodies the qualities of, and is the ostensible representative for, the “386-generation,” the likelihood NPAD is going to win back the youth is low. The election of Moon to position of party chair might, after all, result in a slight boost for NPAD support. Even so, it seems unlikely that Moon can close the support gap with Saenuri. Even more unlikely is the transformation of Moon into a more “progressive” politician who represents what a changing electorate wants.